Amatsu Shrine is said to have been founded during the reign of Emperor Keikō, about 2000 years ago. The shrine is dedicated to the god Amenigishi-Kuninigishi-Amatsuhiko-Hiko-Ho-no-Ninigi-no-Mikoto (or Ninigi for short!) Ninigi was the grandson of the sun goddess, Amaterasu. After the celestial kami took control of Japan from the terrestrial kami, Ninigi sent by his grandmother to establish a dynasty and plant the first rice fields. For this reason, worship of Ninigi is often closely related to the harvest. Amatsu Shrine’s haiden–or worship hall–features an impressive thatched roof, typical of those seen in Japan’s snowy region. The steeply pitched roofs allow the snow to naturally fall off the roof, preventing it from collapsing under the weight. Thatched roofs require regular maintenance and must be rethatched every few years, an expensive and time-consuming process, so it is rare to see buildings still using thatching in Modern Japan. Behind the worship hall is the main sanctuary–or honden–of Amatsu Shrine. It is flanked to the left by Nunagawa Shrine, dedicated to the worship of local goddess Princess Nunkawa and her husband, Ōkuninushi-no-Mikoto. 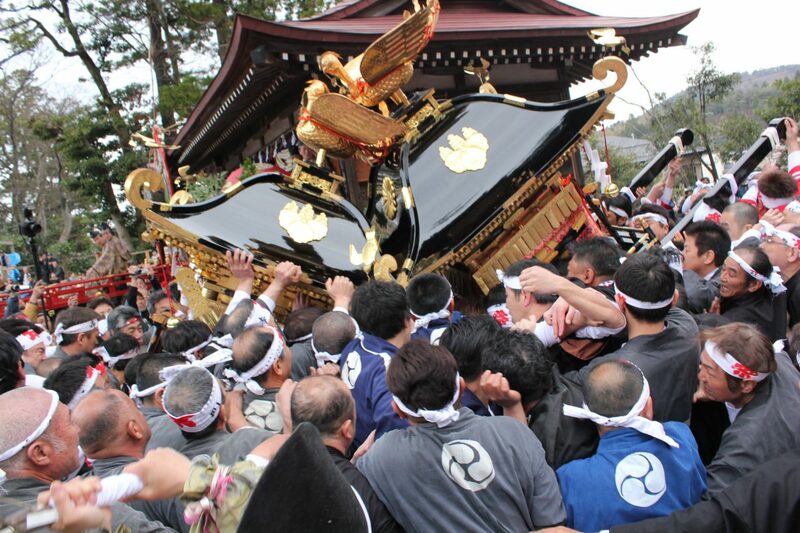 Each April 10 and 11, Amatsu Shrine holds its Spring Grand Festival, the Itoigawa Kenka Matsuri–Itoigawa Fightinf Festival–in which two portable omikoshi shrines are rammed together in a display of strength and bravery.